In the 90’s there were these things called chat rooms. 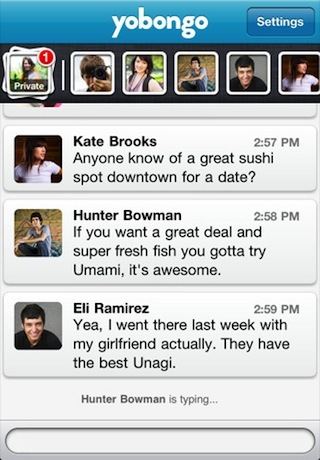 Yobongo is an upcoming iPhone app that will let you chat with people nearby, and bringing back that chat room concept. You would be able to find people based on your and their location via the Yobongo app. For example imagine if you’re at a conference, or say at a bar, and wanted to meet people nearby. Then assuming all those people had the same iPhone app installed, you would jump on and get thrown into the same chat room where you could talk to everyone in the room. Yobongo would handle figuring out who to put in what room, but you can leave and the app would put you into another room. The idea is that you’ll be matched up with people you have things in common with. The only issue is that Yobongo is only available in San Francisco, New York City, and Austin, Texas as of right now. Lots of iPhone apps use the location-based functionality of the iPhone for added functionality. Yobongo is going to be using LBS as a main part of its chatting service. Chatting with friends nearby would be a good thing, especially if they all have the same app installed. Similar to Yobongo, we’ve covered GroupMe, and there’s also HeyTell, both of which are growing quickly in the group-chat iPhone app category. Let’s hope Yobongo can gain enough traction. There is no doubt that its services is useful. Hey if this takes off, you might even see Facebook eventually add a similar service to their app. AppSafari review of Yobongo was written by Joe Seifi on February 21st, 2011 and categorized under App Store, Chat, Social. Page viewed 6908 times, 2 so far today. Need help on using these apps? Please read the Help Page.